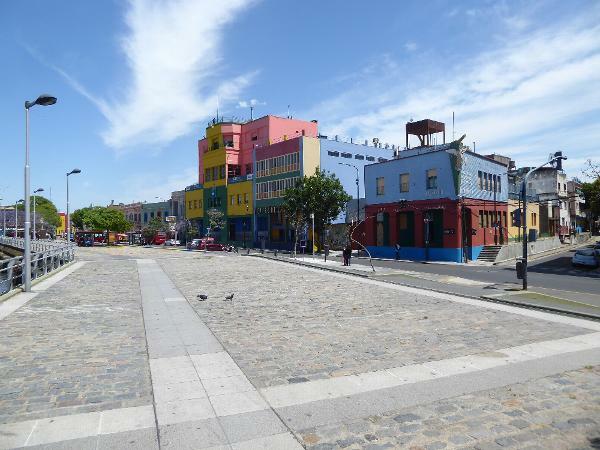 We'll try another transect, this one about four miles long and extending from the city's old port on the Matanza River north to the monument that, until the Falklands War in 1982, was called the "Torre de los Ingleses." The southern boundary of the Buenos Aires Federal District is the Matanza ("Slaughter") River, euphemistically called the Riachuelo or Little River. It flows from right to left here, and the mouth is only a couple of hundred yards thataway. 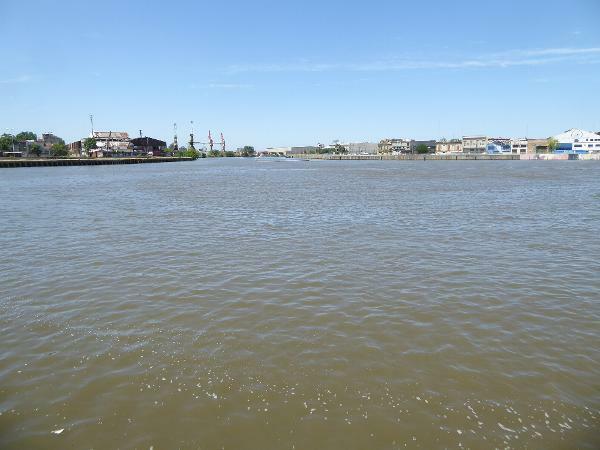 Dredged to a depth of nine feet in the late 1870s, the river is, at that depth, no longer a commercial port. In other words, the container cranes in the distance are deceiving; they serve a terminal on an artificial channel just beyond them. That channel is the Rio Dock Sud, which joins the Riuchuelo about a kilometer downstream from our location. The Dock Sud was part of a greater but abortive port-development scheme a century ago. 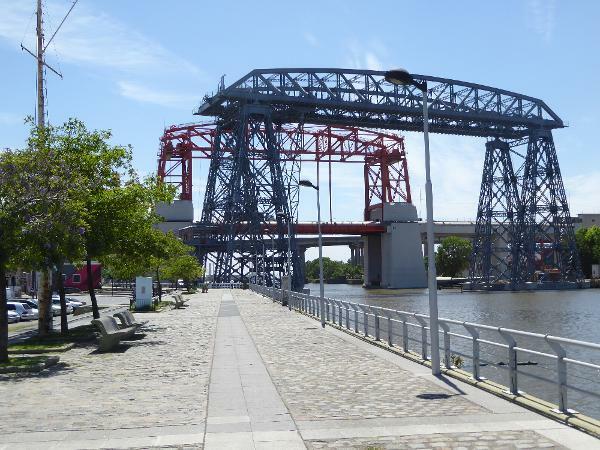 Beween the old port and the sea, there are modern bridges (two are in the distance here) but there's also this oddity, a transporter bridge, built to carry a platform back and forth across the river. The platform, eight meters by twelve, was big enough to carry several vehicles and a small crowd of pedestrians. You can see it there on the left. 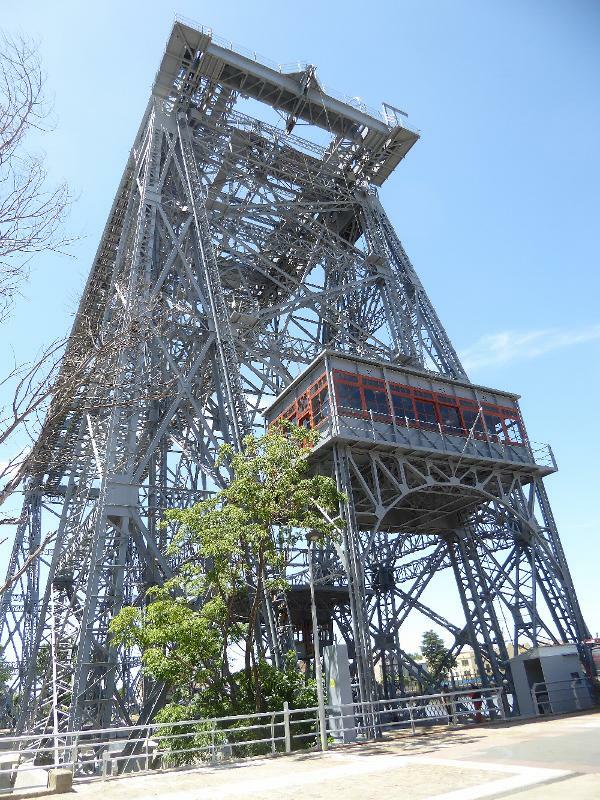 The Puente Transbordador operated from 1914 to 1960. How did it work, exactly? Beats me, but you can find old photos showing the platform mid-stream. The platform appears to have been modified since then and fitted with windows. How passengers and vehicles got to it? You'll have to ask somebody else. The neighborhood on this side of the river is called Boca, which make perfect sense unless you've forgotten every blinkin' bit o' yer never very good high-school Spanish. Boca's an overwrought tourist neighborhood now, but right here there's one interesting thing. See it? 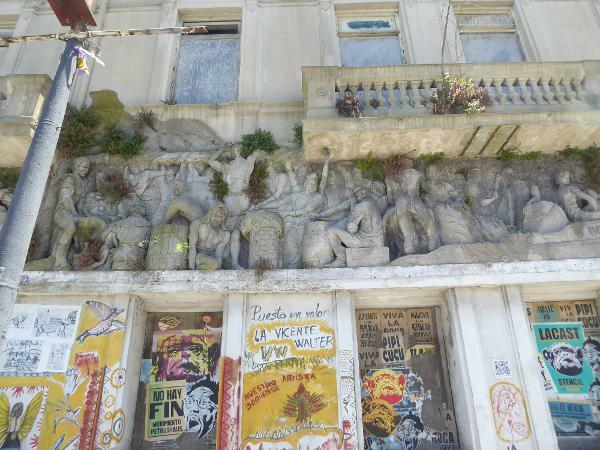 It's this frieze, which wraps the old Southern Maritime Supply Building. The exact subjects aren't clear to me, but the whole thing is about real men doing real work. As the graffito says, there are 14 of these murals in the neighborhood. The sculptor was Vicente Walter; I don't know why he chose not to portray lawyers and accountants and the job creators. He did name the dory after himself. Here's a view of the waterfront, recently fixed up for lots of visitors. 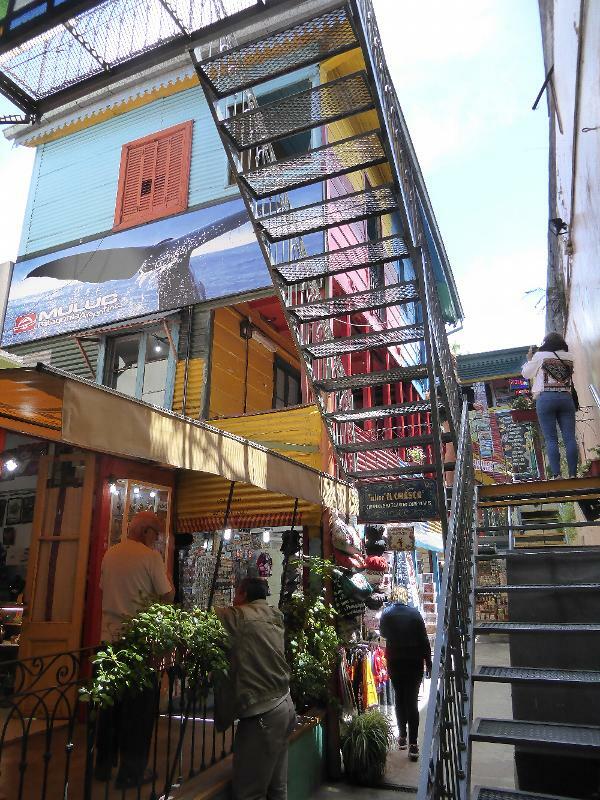 And here, coming in at the right, is the tourist central Caminito, the "little walkway." It once carried a railway track along the course of a vanished creek. With the decline of the port, the whole neighborhood decayed until a local artist began painting walls. Presto!, tourists came. It's the kind of story to inspire the hundreds of small towns hoping almost everywhere to find rejuvenation through art. The painter was Benito Quinquela Martín (1890-1977), and his career was remarkable, considering that he was abandoned as an infant and turned over to a family whose livelihood was handling coal. Perhaps they truly loved him, because at 14 he began attending an art school part time, and a few years later he attracted the attention of Argentina's President Torquato de Alvear. With that support he moved to Spain and a job at the Argentine consulate. 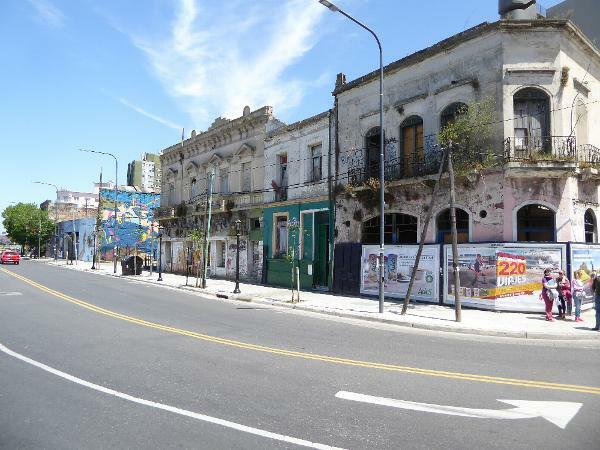 He began travelling widely in Europe and the United States but ultimately, in 1930, returned to the place he was born and began painting the walls of Boca's decaying buildings. Visitors came, shops followed, and you know the rest. 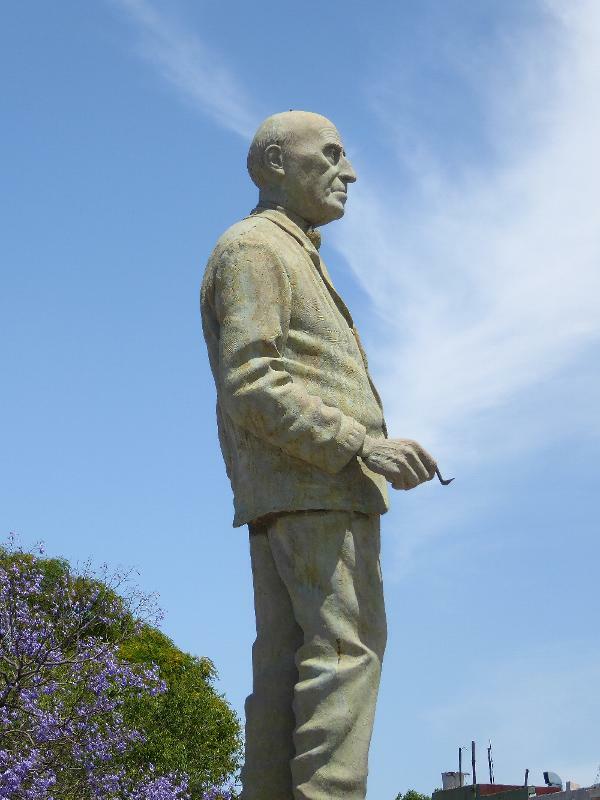 A statue of Martín stands on the waterfront in recognition of his importance. The district's name is said to have come from a tango called "Caminito," written by Juan de Dios Filiberto in 1926. The subject was not this place but one far to the west, beyond Cordoba. 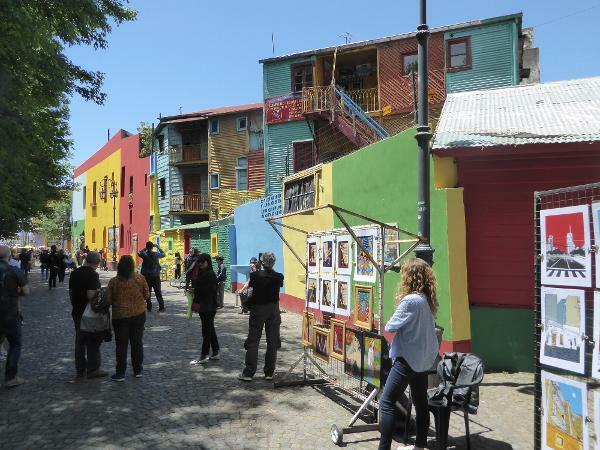 Still, the song is said to have inspired Martín to embark on his street-painting. Since then, old slums ("conventillos") have been converted to shopping centers--and, yes, the name of this one has become appropriate. Was this Martín's palette? Maybe, maybe not, but the year before his death in 1977 he painted his own coffin and explained that nobody who had lived surrounded by color should be buried in a plain box. Some sources suggest that the painted walls originated with homeowners who once got cheap leftover paint from shipping companies. Perhaps it's true, but a few blocks from Caminito the colors turn pallid. The tracks haven't been pulled here, nor the light poles that from their design alone must predate World War I. Some of the buildings here hint at conditions here before the neighborhood's rejuvenation. We're jumped a mile and a bit to the north. 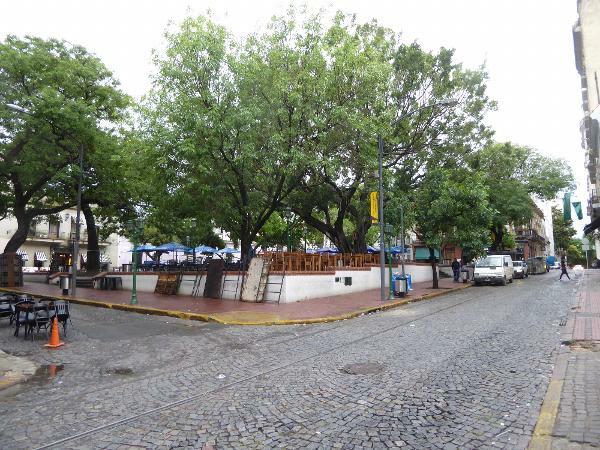 This is Plaza Dorrego, the heart of the neighborhood called San Telmo. The tracks here aren't the same as those in Boca. These belonged instead to the city's now gone but once fantastically dense streetcar network, which itself replaced an equally dense and vanished network of horse-drawn trams. 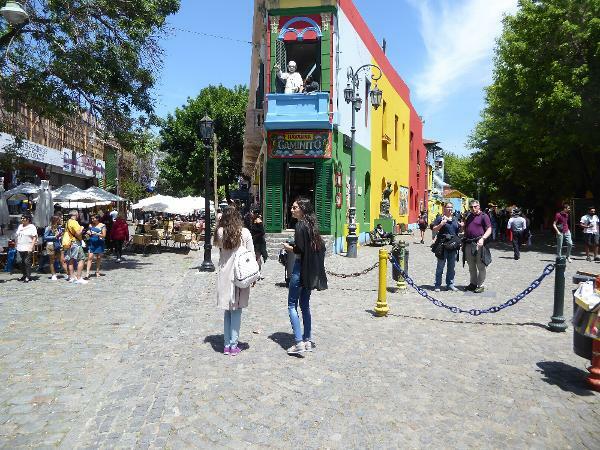 San Telmo, named for the patron saint of seafarers, was a wealthy neighborhood until the 1870s, when yellow fever persuaded affluent residents to move north several miles to barrios such as Retiro and Recoleta. 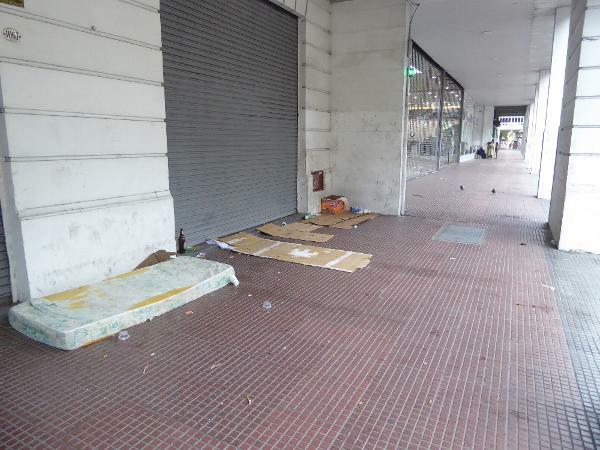 San Telmo's slump. proved to be its salvation, because with the conversion in 1986 of an old cigarette factory to a museum of modern art, the neighborhood began a second life as a heritage attraction. Buildings around the square aren't quite what they seem: behind the facades, this group is a single hotel. Ummm. We're going to start arguing over definitions. 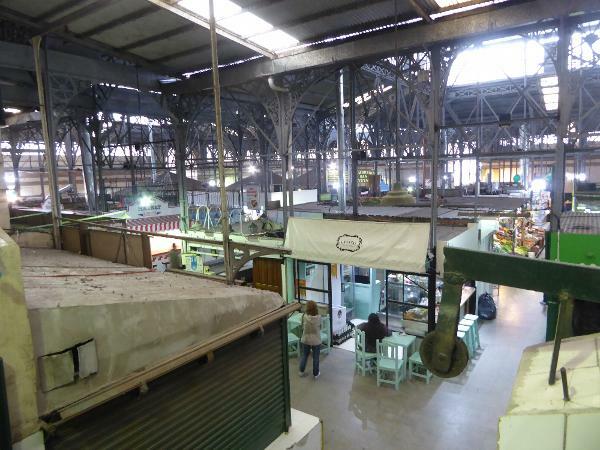 Up top, it reads "Mercado San Telmo". We're a block north of the plaza. The inside looks like this on a quiet afternoon. The date: 1897. 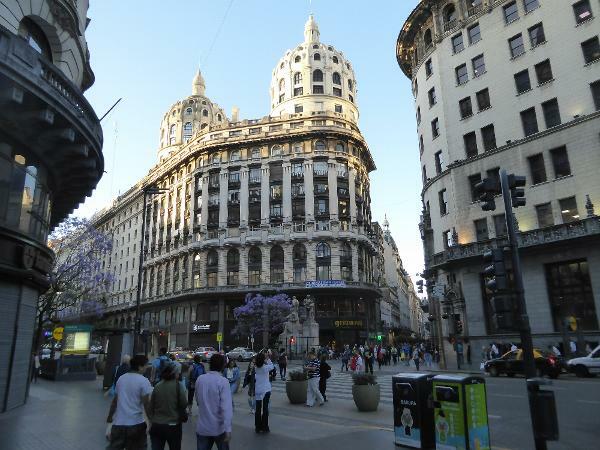 The designer: Juan Antonio Buschiazzo, the same who designed the Avenida de Mayo. 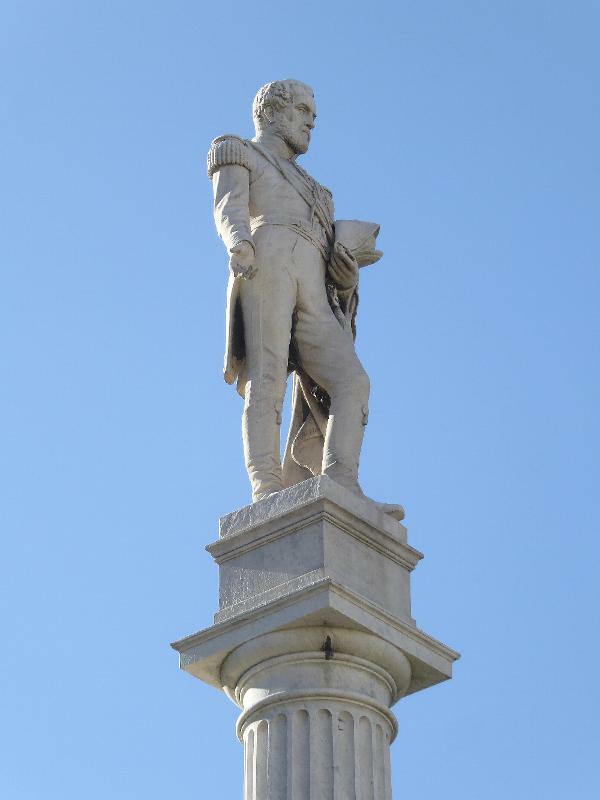 He's high on the short list of men who can sit back and say, "Want to see my monument? Look around." Half a block east of the plaza, here's School 22. Up top, you can catch a few letters of the name Guillermo Rawson. There's a town named for him, too. He was a physician who, drawn into politics, served as Interior Minister in the 1860s. The school's hasn't been around that long, but it's been here over a century. It's easy to assume from the ornament that it's a parochial school. Not so. 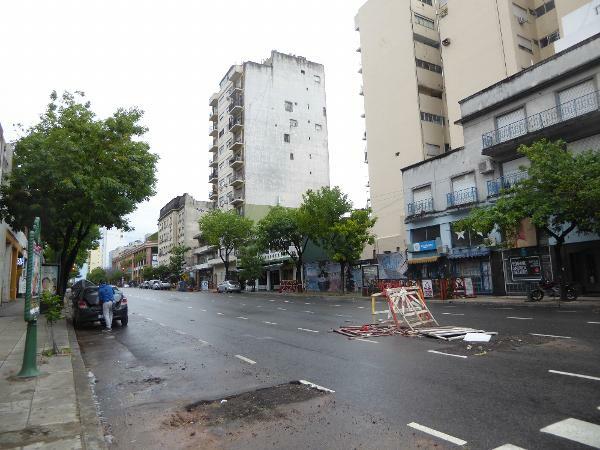 San Telmo remains an island, so to speak, and a block to the south of Plaza Dorrego, here's Avenida San Juan. Ironically, the brick building in the distance is the old cigarette factory that, converted to an art museum, helped revivify the neighborhood. "Helped" is the operative word. 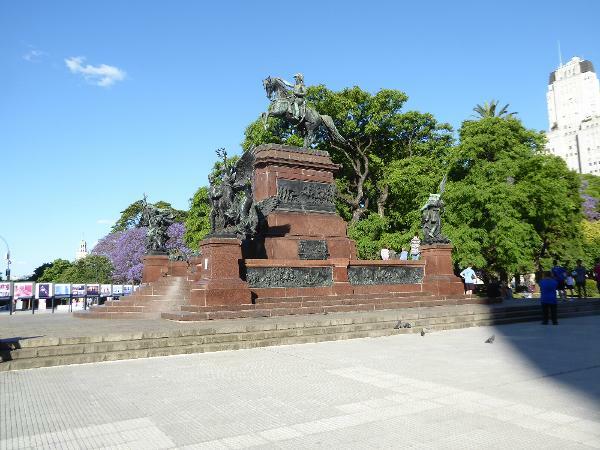 The Paseo Colón is an arterial that runs south from the Casa Rosada and passes a few blocks east of Plaza Dorrego. 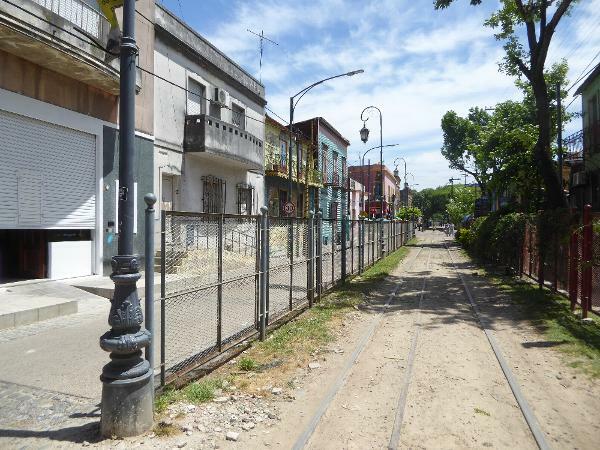 The street once bordered the Rio de la Plata, but landfilling has left it a mile shy of the water. Lots of buildings have moved in to occupy the space. The one of the right, completed in 1919, houses the Department of Agriculture (now Agro-industry); the one on the left since 1956 has housed the University of Buenos Aires School of Engineering. 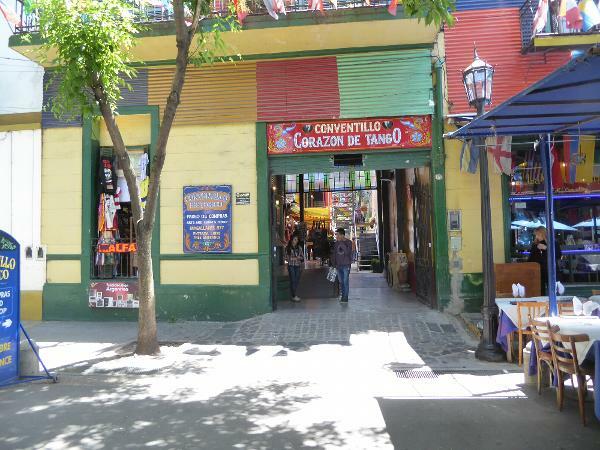 Its history is more interesting: it opened in 1948 as the home of the Eva Perón Foundation. She died four years later, and the Foundation went into a brief and terminal decline, closing in 1955. We've jumped a mile to the northwest and are back on the pedestrian-challenging Avenida de 9 Julio. 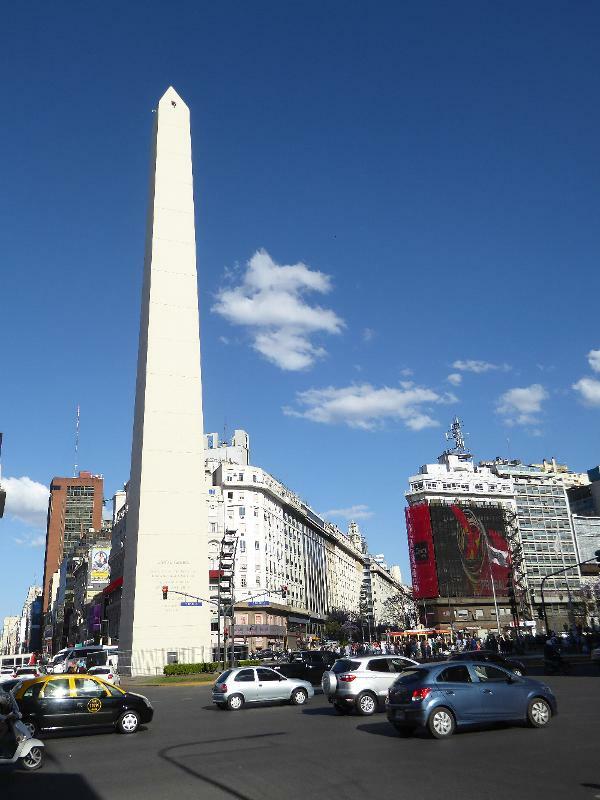 The obelisk was built in 1936 to celebrate the centenary of Argentina's independence. Surprisingly late to choose such a form; odd, too, that something so imitative should be built to celebrate freedom. On the other hand, it's easy to build what you know, and this obelisk was built by Siemens of Germany in all of 31 days. 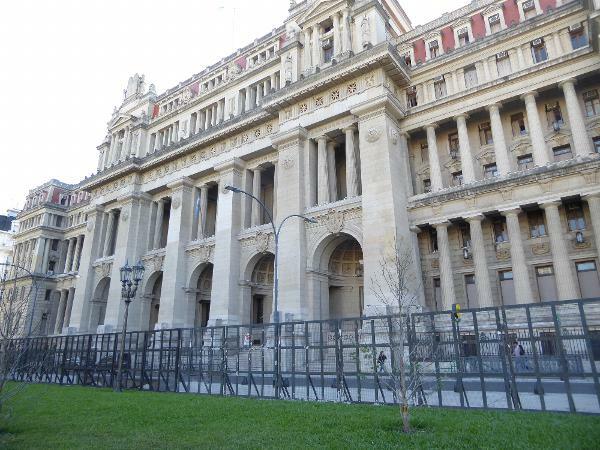 The fence around its base, like so many fences in Buenos Aires, deters protesters with spray paint. The street straight ahead breaks the grid established in 1580 by Captain Garay and brings in a diagonal. Maybe that sounds original, but for a city striving to be another Paris it isn't innovative at all. The street was pushed through in 1913. Notice the roof line, level enough to warm the chilled ghost of Haussmann. 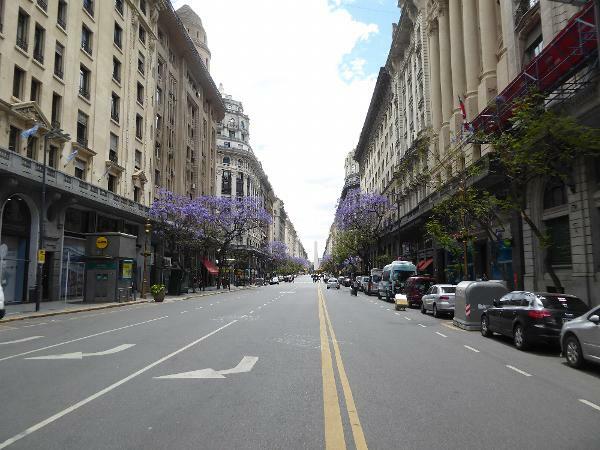 Here's the view from near the Plaza de Mayo down the diagonal toward the obelisk. Some of the buildings along the street respect the height limit while slyly violating it. Here, for example, is the Bencich Building of 1927, an office building designed by Eduard Le Monnier. The Bencich brothers, Massimiliano and Miguel, owned a construction company. That's handy. The almost matching but simpler building on the right was completed a few years earlier for the First National Bank of Boston. It now houses ICBC, the Chinese bank. The world turns. The city has many such ornate, domed corner buildings. 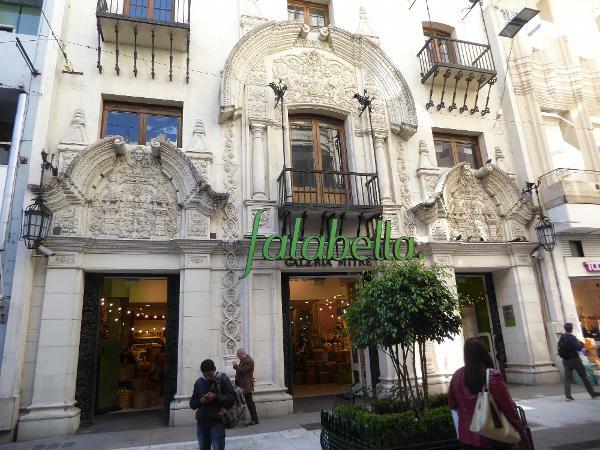 This one was built in 1914 for Gath & Chaves, known colloquially as Gatichaves. It was stylish enough that Harrods bought it in 1922. The store closed in 1974 and the building became a bank but has more recently returned to the rag trade. 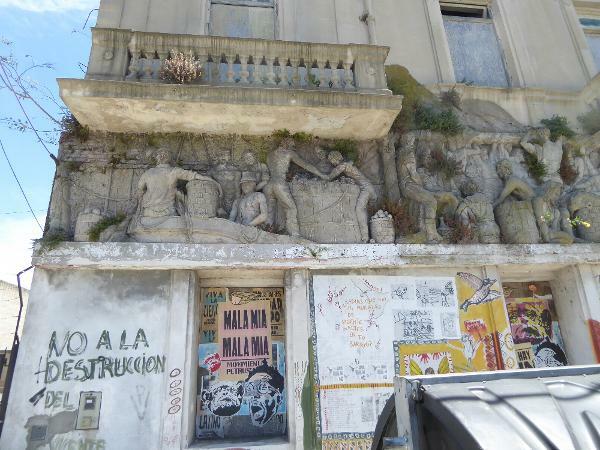 Another building of the genre, this one at the corner of Callao and Sarmiento, not far from Congreso. 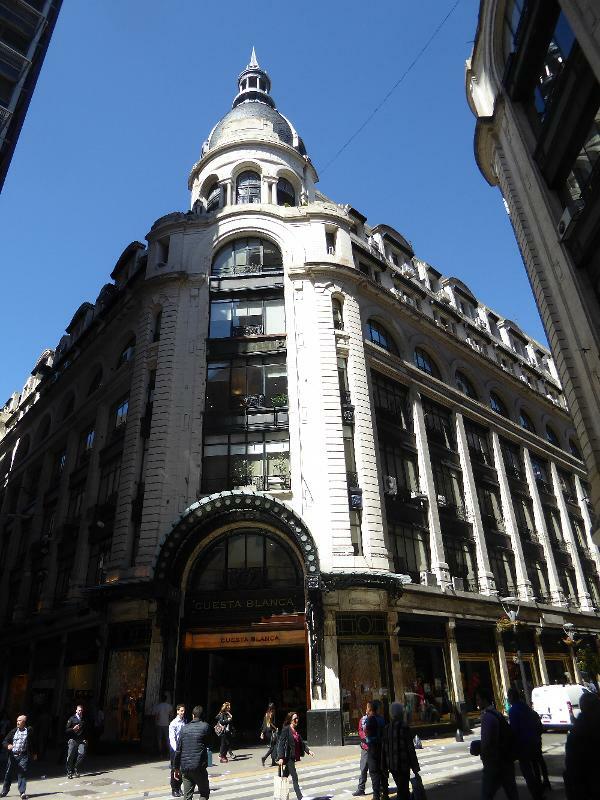 Seven blocks north but still on Callao, here's what's left of one in the Art Nouveau style. Completed in 1909, it was called the Palacio Costaguta for its owner, David Costaguta. The architect was Alfred Massüe. The original building had four floors and was mostly residential. Demolished in 1989 except for the tower, it was replaced by an office building. 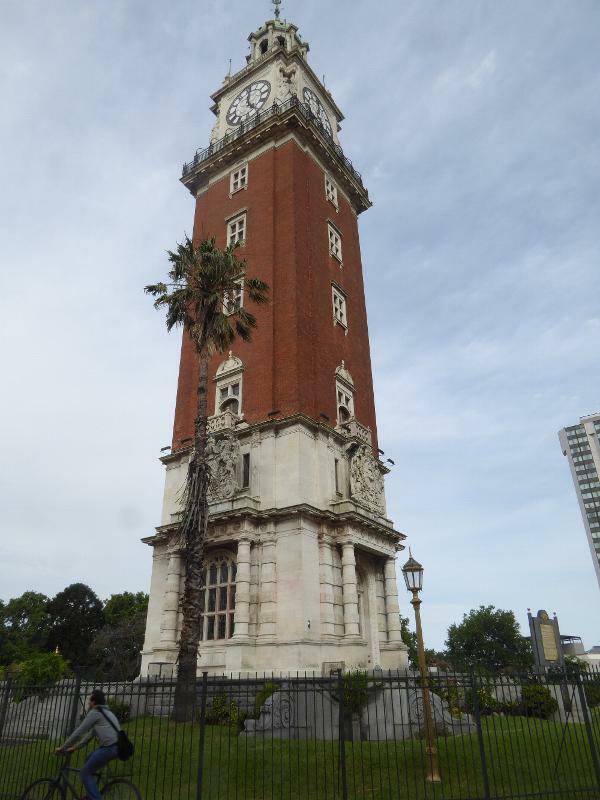 A tower lookout survives, which explains the building's nickname, Mirador Massüe. 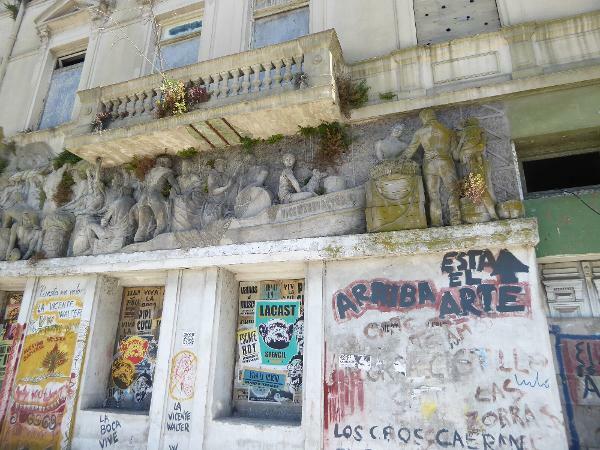 Here's another of Massüe's buildings, this one on Avenida de 9 Julio at Rivadavia. 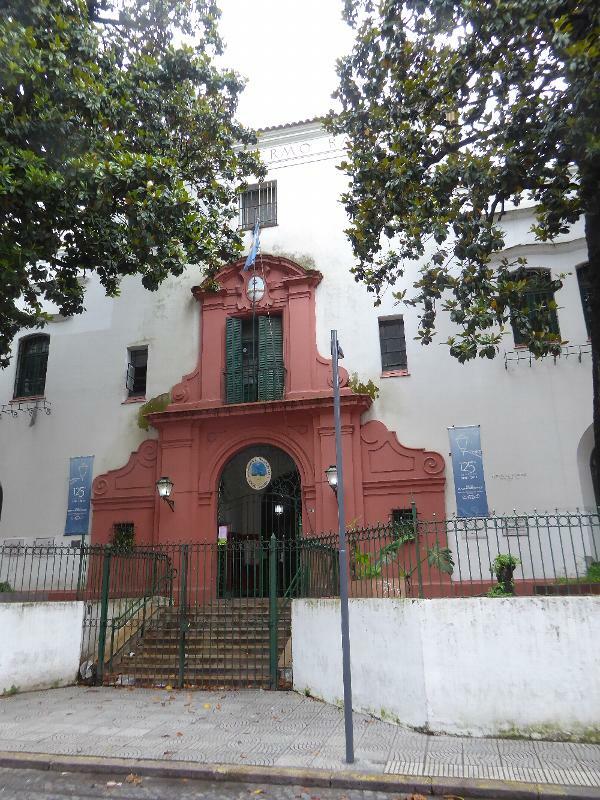 It was completed as an apartment building in 1902 for Belisario Hueyo, a judge and senator. Makes you wonder what it looked like before the guys with hammers went to work in 1939. Massüe had the good sense to die in 1923. In the midst of this would-be Paris, there are reminders of an older city. 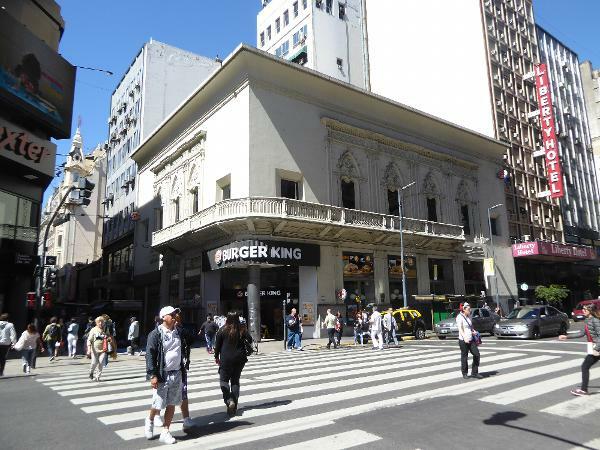 Here, at the busy corner of Florida and Corrientes is the former home--sorry, palacio--of Carlos Maria Diego de Alvear. It dates from the 1870s. The family lived upstairs while the ground floor was commercial--for a time a cigar store, a cafe, a leather-goods store. In 1989 Mr. BK arrived. 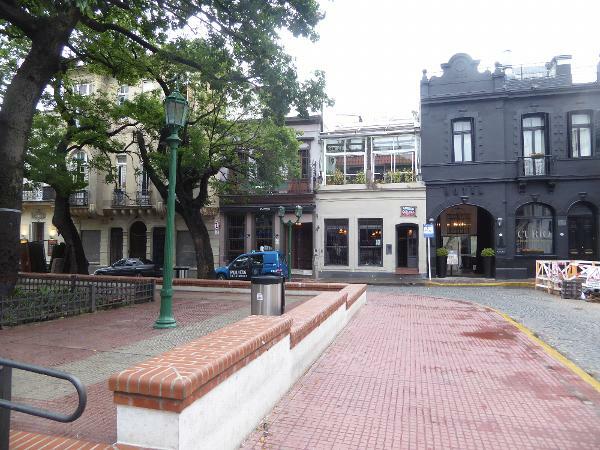 Florida, by the way, has been pedestrianized since 1971 (parts of it since 1913); Corrientes, on the other hand, was widened in the 1930s. 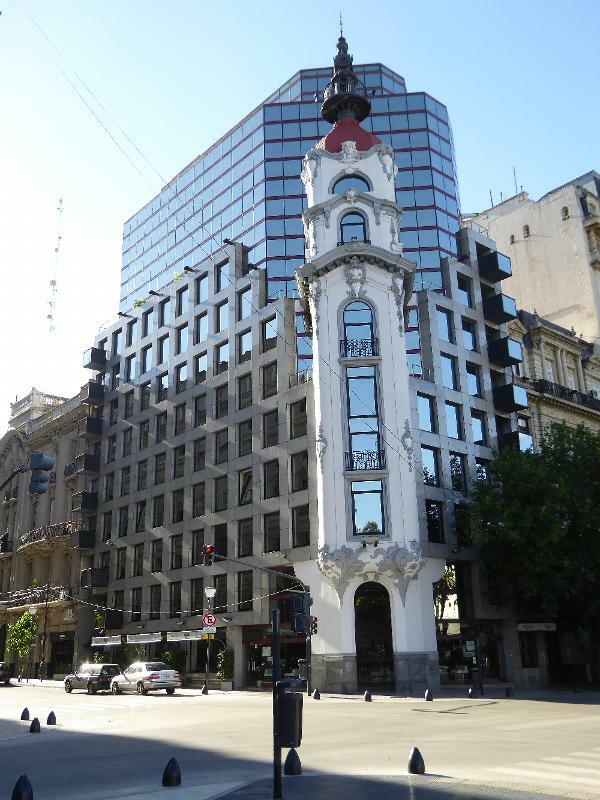 Conservative ornamentation wraps this building, too, built in 1930 for the conservative La Nación. This Chilean chain moved in during 2005. 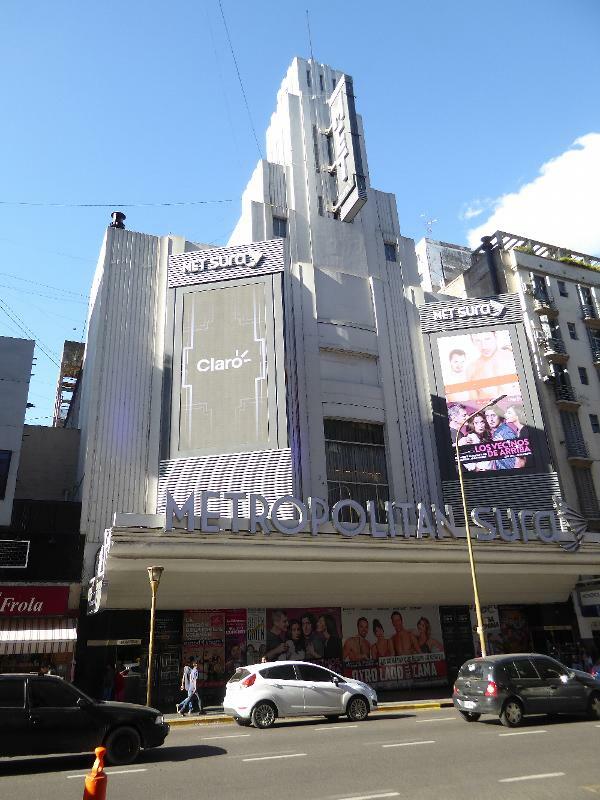 Just a few years later, in 1937, the Sura Metropolitan Theater opened on the newly widened Avenida Corrientes. It's been split since then but originally held 2,000 seats. 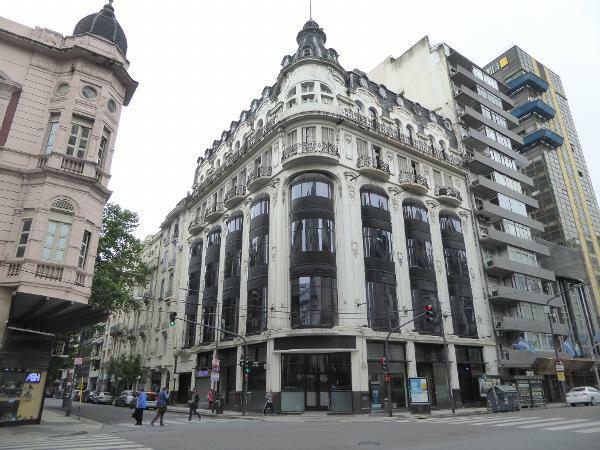 The developer was Clemente Lococo, who owned many theaters in Argentina. 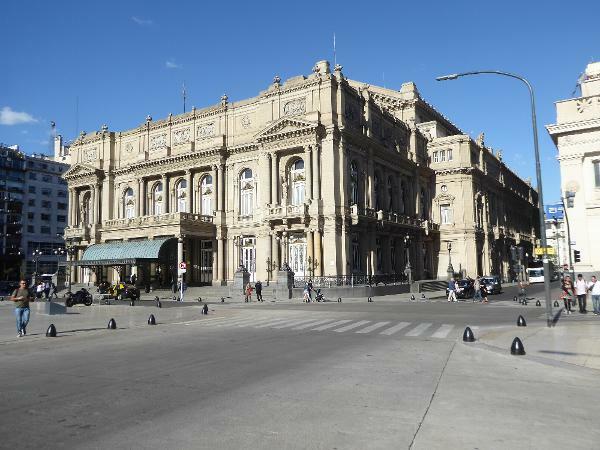 Speaking of theaters, here on the left is the famous Teatro Colon, which opened in 1908 with (yawn) Aida. Several architects were involved, including Julio Dormal, who was the last of the several architects working on Congreso. We'll see the other side in a minute. The grandiose building on the right is the Roca Elementary School, from 1903; the architect was the Neapolitan Carlo Morra, and the statuary was by Giovanni Arduino. The school attempted to live up to the instructions of President Sarmiento, who as far back as 1849 said: "Our schools must be constructed in such a way that their show works daily on the spirit of the children, educates their taste...." How times have changed. 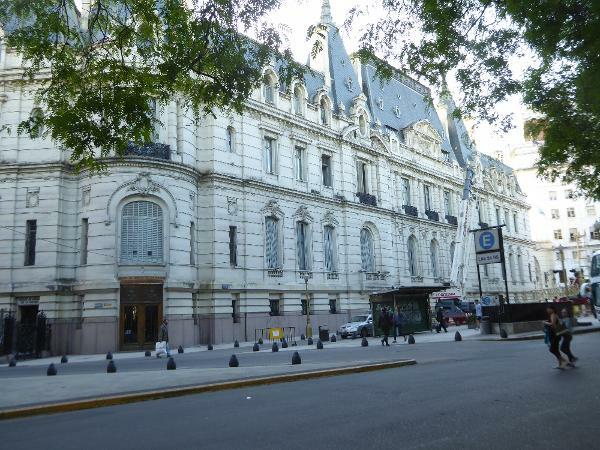 Here's the other side of the opera, fronting 9 de Julio. 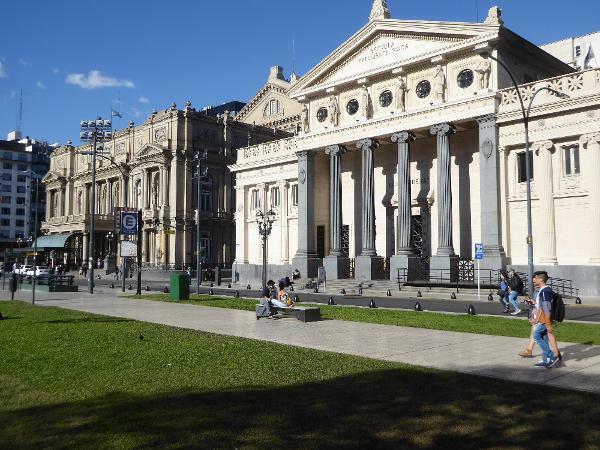 The school and theater both look across the Plaza Lavalle at Tribunales, the law courts whose construction took forever. Officially finished in 1942, the building began functioning in 1912. Nice barricades. 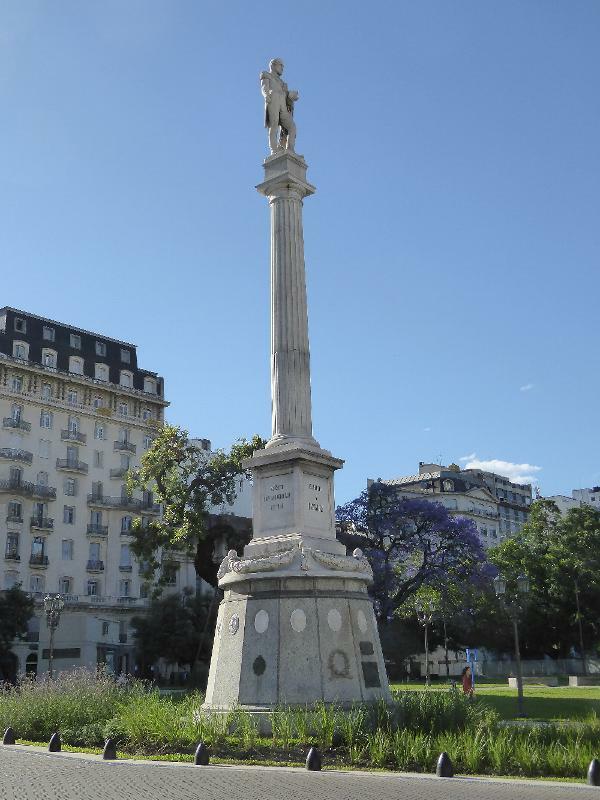 Plaza Lavalle has a commemorative column for another hero of the revolution. Juan Galo Lavalle (1797-1841), sculpted here by Pietro Costa, had reason to be philosophical. During the country's interminable civil war, he had in 1828 ordered the execution of Plaza Dorrego's namesake, Manuel Dorrego. A dozen years later, Lavalle was killed by a lucky shot from the same opposing force that Dorrego had supported. Worried that the enemy might mutilate the body, Lavalle's men carried it to Bolivia and boiled it to save the skeleton, which in due course was buried in the Recoleta cemetery. 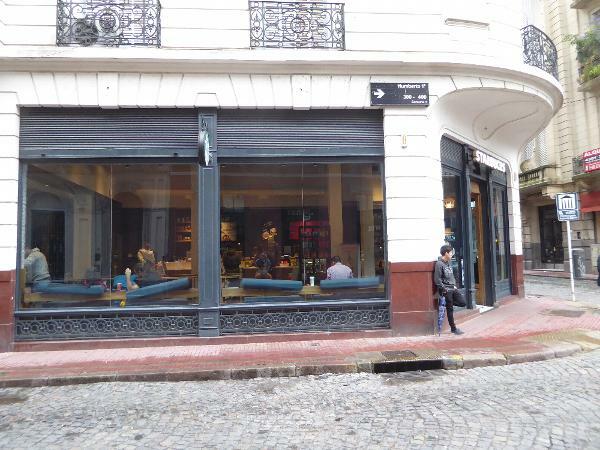 So was Dorrego's. We've seen so many war heroes, but here's a repeat. we already saw his tomb at the cathedral, remember? 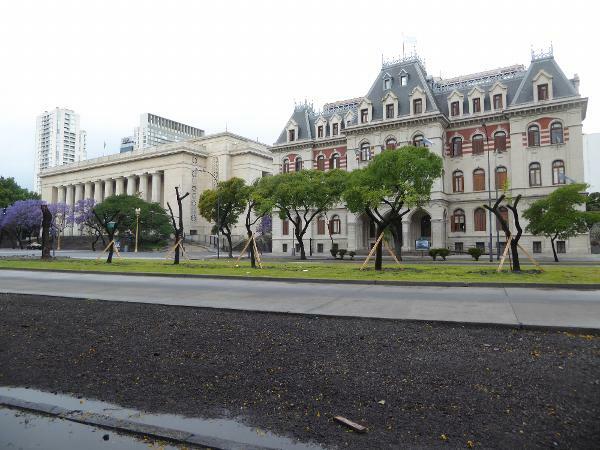 The plaza was designed by Charles Thays, the same who designed the park in front of Congreso. The statue was commissioned from Louis-Joseph Daumas in 1862, and there are at least 44 replicas of it around the world, including in New York City and Washington, D.C. 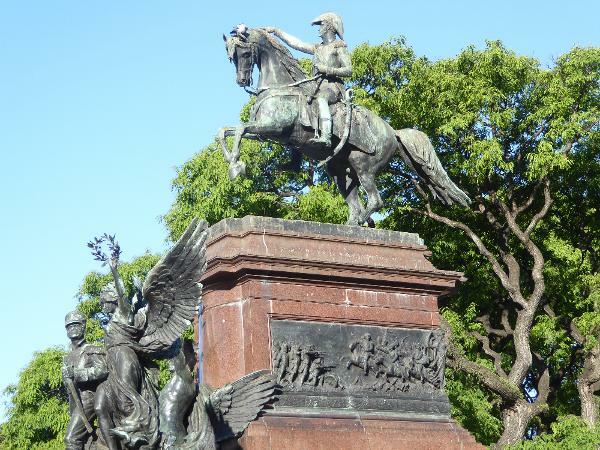 It's the Libertador, of course, Don Jose de San Martin. 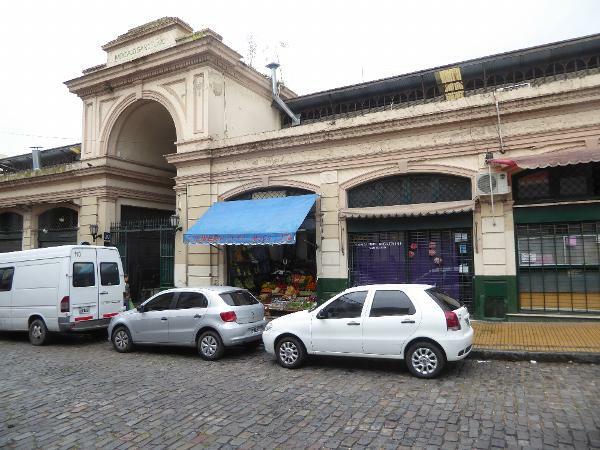 The Palacio Haedo faces the plaza. 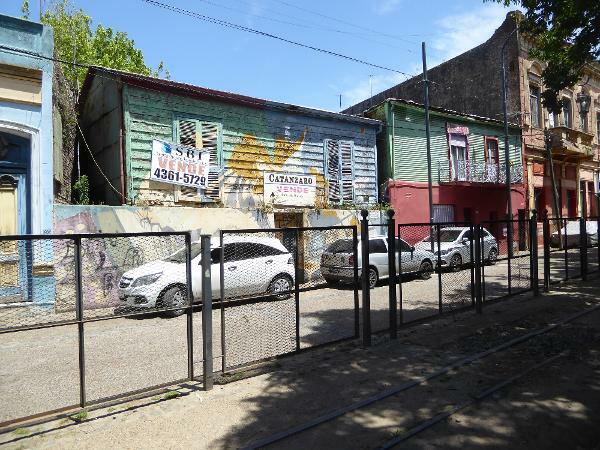 Now the office of Argentina's national parks, it was built as the home of Mariano Francisco Haedo (1816-1886), who had made a fortune in railroads and banking. Perhaps he had a lot of stuff, because the architects Passeroni and Brizuela gave him a helluva storage unit. 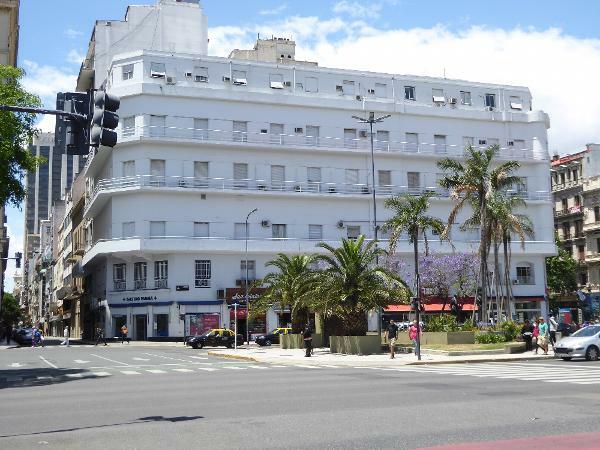 In 1972 the Sheraton gave Buenos Aires its first taste of American-style hotels. Over in the distance on the right is the Kavanaugh Tower, built in the 1930s by one Corina Kavanaugh who apparently wished to spite the family that lived next door and one of whose sons she had hoped to marry. Alas, she was a commoner and would not do, no matter how much money she had. 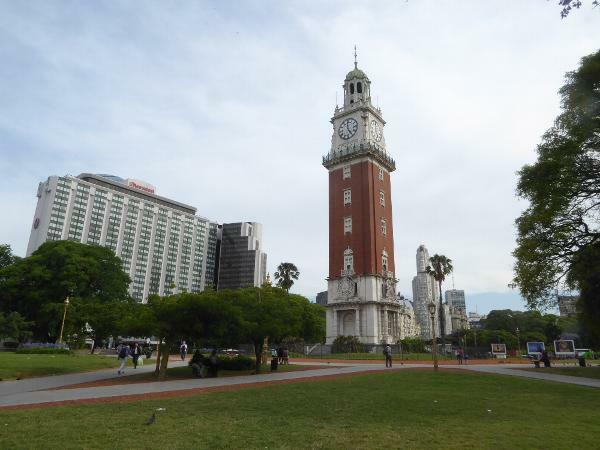 The Torre Monumental, until the Falklands War the Torre de los Ingleses, was built as yet another monument to Argentina's Independence. Inaugurated in 1916, the architect was Sir Ambrose Macdonald Poynter, whose name alone was credential enough. 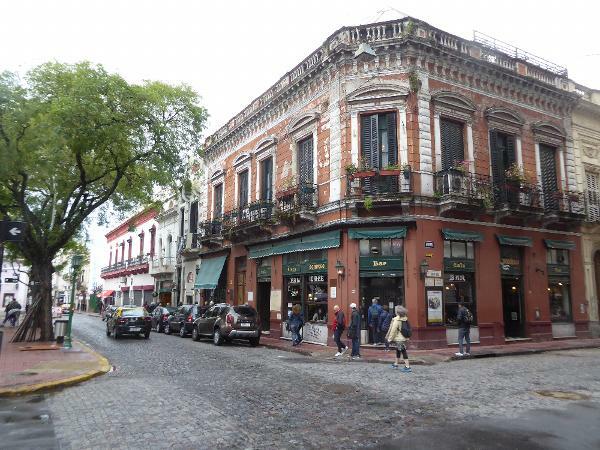 The style is said to come from the late 16th century, when Buenos Aires was founded. In past years, visitors could ascend to the top for a view; no more. Instead, we have a fine protective fence.